…we are building the road in order to facilitate visitors to Mt. Everest. In his blog China Rises, McClatchy newspapers Beijing bureau chief Tim Johnson writes – as many others have recently – about China’s plans to pave the 67 mile road from Tingri (click for an image) to Everest Basecamp. So, what is the truth? Will the paving of the road help tourists and bring development to the region? I doubt it. For starters, let’s keep in mind that the road from Tingri (two of them, actually – one direct and one going over the Pang La Pass) has existed for many years…and has been recently improved. While on the 2001 Mallory & Irvine Research Expedition, our team awoke each morning to thunderous explosions. These weren’t avalanches – which one would expect to hear near Everest – but rather the sound of dynamite as workers blasted a new road cut from the top of the 18,000 foot Pang La to the village of Tashi-dzum and on to Rongbuk. This was a proud feat of engineering, the road replete with guardrails and signposts as it made delicate switchbacks down the mountainside. 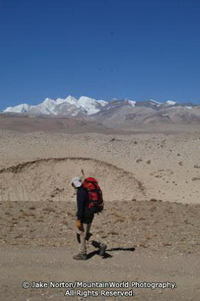 But, did it serve its purpose of making the journey to Rongbuk better? According to TMA officials and locals I spoke to in 2004, not at all. Truck drivers were frustrated that the new road was many miles longer than the old road due to the new switchbacks, and thus they burned more fuel getting to Basecamp and instead took the old, direct (and bumpy) road from Tingri. Will paving the road make it easier for tourists to reach Basecamp? Probably, as the Toyota Land Cruisers which are standard transport on the Tibetan Plateau will be able to make the journey on smooth blacktop. But, getting to Basecamp – at 17,000 feet – quickly is not really a good thing. Already, many tourists arrive at Basecamp during the climbing season, hop out of their vehicles, and find themselves almost immediately feeling the effects of Acute Mountain Sickness (AMS). Many don’t enjoy their stay as a result, and others try to tough it out only to have their condition progress to the more severe altitude ailments of High Altitude Pulmonary or Cerebral Edema (HAPE and HACE, respectively). As the snail’s pace of an Everest expedition demonstrates, taking your time when ascending to high altitude is always the best recipe. On the topic of bringing development to the region, I must admit I have my doubts. While strides have been made in recent years in Tibet with more economic benefits coming to the Tibetan people, the vast majority of this has happened in urban areas like Lhasa, Shigatse, and Gyantse. In the rural hinterlands of Tibet, most Tibetans find their situation has changed little since Chinese occupation aside from the loss of many monasteries and the introduction of electricity in some areas. Even in easily accessed areas like the towns along the major north-south trade route, the Friendship Highway, Tibetans have seen very little development and most businesses are controlled and run by ethnic Han Chinese. And, finally, there are very few people who live along the route of the proposed road; there are only a handful of tiny settlements culminating in the famed Rongbuk Monastery, once a place of quiet meditation and pilgrimage for Tibetan Buddhists. Personally, I am willing to bet the paving of the road to Basecamp is nothing more than a prelude to the building of hotels, restaurants, and other additions of "civilization". While Qiangba Puncog may deny plans to build hotels at Basecamp, there have actually been plans at least since 2001 to build a permanent hotel at Basecamp, and the Chinese already constructed on immediately across the road from Rongbuk Monastery. Personally, if I thought the road to Basecamp would better the lives and condition of local Tibetans, I would be all for it. But, sadly, I think this is a stunt by Beijing officials to bring in more tourists and – literally – pave the way for the Olympic Torch to go to the summit of Everest in 2008. If you have thoughts or comments on this, please submit them! Thanks for expanding upon this report about the new road. I heard last year that the Chinese were intitally looking into the feasibility of carrying the Olympic torch to the top of Mt. Everest. You would think some areas of the world (especially as remove as Everest) would simply be left alone with regard to commercialization. Glad you liked the report. It would be nice if Everest and other pristine (or once pristine) places could be left alone as you mention, but it seems we as humans become obsessed with certain places and then want to change them to fit our needs. Thanks for your comment, and your great blog! Good post. It’s sad to see a place like Everest turning into a place of mass tourism. But I guess what China wants, China can get now. Very sad to see this indeed. Topic has been on the radar lately, especially with the publication of the book by Michael Kodas. Great post Jake. Hope all is well with you these days – ice climbed with you back in Ouray about 10 yrs ago.